This is the second post based on a Patreon poll about the RPA Fourth Regional Plan. See the first post, about Third Avenue, here. The most egregious example is another transit project favored by a political heavyweight: the LaGuardia AirTrain, championed by Governor Andrew Cuomo. Though he touts it as a one-seat ride from Midtown to LaGuardia, the vast majority of airport travelers going to Manhattan would have to go east to Willets Point (a potential redevelopment site) before they could go west. Even airport employees would have to backtrack to get to their homes in Jackson Heights and surrounding neighborhoods. As a result, it wouldn’t save airport riders any time over the existing buses. Once again, it’s proven unpopular with transit experts and advocates: [Ben] Kabak mocked the idea as vaporware, and Yonah Freemark showed how circuitous this link would be. When Cuomo first proposed this idea, Politico cited a number of additional people who study public transportation in the region with negative reactions. Despite its unpopularity—and the lack of an official cost for the proposal—the AirTrain LaGuardia is included in the RPA’s latest plan. But there is an alternative to Cuomo’s plan: an extension of the N/W train, proposed in the 1990s, which would provide a direct route along with additional stops within Astoria, where there is demand for subway service. Community opposition killed the original proposal, but a lot can change in 15 years; Astoria’s current residents may well be more amenable to an airport connector that would put them mere minutes from LaGuardia. Cuomo never even tried, deliberately shying away from this populated area. And the Fourth Plan does include a number of subway extensions, some of which have long been on official and unofficial wishlists. Those include extensions under Utica and Nostrand avenues (planned together with Second Avenue Subway, going back to the 1950s), which also go under two of the top bus routes in the city, per [Jarrett] Walker’s maxim [that the best argument for an urban rail line is an overcrowded bus line, as on Utica and Nostrand]. There is also an extension of the N/W trains in Astoria—though not toward LaGuardia, but west, toward the waterfront, where it would provide a circuitous route to Manhattan. In effect, the RPA is proposing to stoke the community opposition Cuomo was afraid of, but still build the easy—and unsupported—airport connector Cuomo favors. My views of extending the Astoria Line toward LaGuardia have evolved in the last few years, in a more positive direction. In my first crayon, which I drew in 2010, I didn’t even have that extension; I believed that the Astoria Line should be extended on Astoria Boulevard and miss the airport entirely, because Astoria Boulevard was the more important corridor. My spite map from 2010, give or take a year, connects LGA to the subway via a shuttle under Junction, and has a subway branch under Northern, a subway extension that I’ve been revising my views of negatively. The issue, to me, is one of branching and capacity. 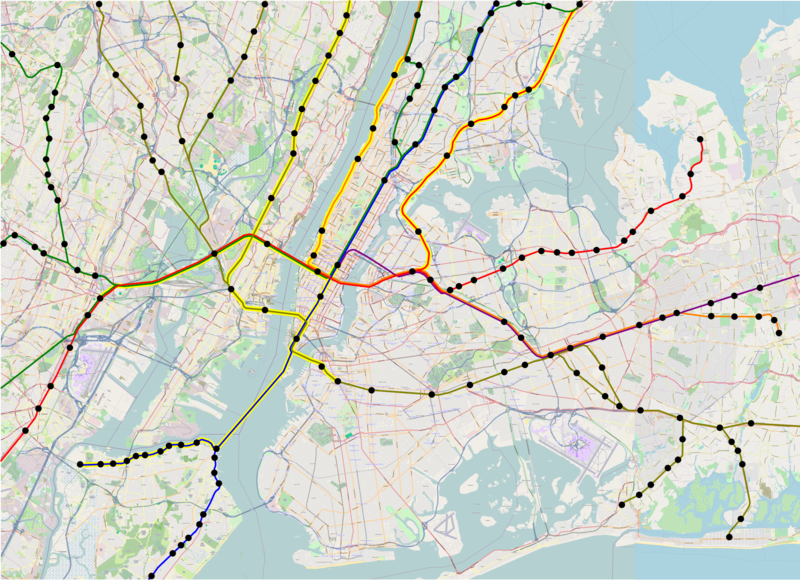 The Astoria Line is a trunk line on the subway, feeding an entire tunnel to Manhattan, under 60th Street; the Queens Boulevard Line also feeds the same tunnel via the R train, but this is inefficient, since there are four trunk lines (Astoria, Flushing, and Queens Boulevard times two since it has four tracks), four tunnels (63rd, 60th, 53rd, Steinway/42nd), and no way to get from the Astoria Line to the other tunnels. This was one of my impetuses for writing about the problems associated with reverse-branching. Among the four trunks in Queens, the Astoria Line is the shortest and lowest-ridership, so it should be extended deeper into Queens if it is possible to do so. The RPA is proposing to extend the Astoria Line, to its credit. But its extension goes west, to the waterfront. This isn’t really a compelling destination. Development isn’t any more intense than farther east, and for obvious reasons it isn’t possible to extend this line further; the RPA’s proposal would only add one stop to the subway. In contrast, an eastern extension toward LGA could potentially rebuild the line to turn east on Ditmars (with some takings on the interior of the curve at Ditmars and 31st), with stops at Steinway and Hazen before serving the airport. The intensity of development at Steinway is similar to that at 31st and Ditmars or at 21st, and Hazen also has some housing, albeit at lower density. Then, there is the airport, which would be about 8 minutes from Astoria, and 26 minutes from 57th and 7th in Manhattan. This is a different route from that proposed in the Giuliani administration, involving going north above 31st and then east farther out, running nonstop to the airport (or perhaps serving a station or two) through less residential areas, but I believe it is the best one despite the added impact of running elevated on Ditmars. LGA is not a huge ridership generator; total O&D ridership according to the Consumer Airfare Report is around 55,000 per day, and 33% mode share is aspirational even with fast direct service to Manhattan hotels and an easy connection to the Upper East Side. But it still provides ridership comparable to that of Astoria Boulevard or Ditmars on the line today, and Steinway and Hazen are likely to add more demand. If the MTA closes the 11th Street Connection, taking the R from 60th Street Tunnel to the Queens Boulevard Line, in order to reduce the extent of reverse-branching, then the Astoria Line will run under capacity and need this additional demand. The total number of boardings at all stations, including Queensboro Plaza, is 80,000 per weekday today, plus some transfer volumes from the 7, which empties at Queensboro Plaza as 60th Street Tunnel provides a faster route to most Manhattan destinations than the Steinway Tunnel. An LGA extension should add maybe 40,000 or 50,000 weekday riders, without much of a peak since airport travel isn’t peaky, and make it easier to isolate the Astoria Line from the other Queens lines. This is not possible with a short extension to the waterfront as the RPA proposes. I’ve seen someone suggest somewhere I don’t remember, perhaps on Twitter, that the reason the RPA plan involves an extension of the Astoria line to the west is to insidiously get the correct extension to LGA passed. If the RPA can propose an el in Astoria and not be killed by NIMBYs, then it will prove to Cuomo that NIMBYism is not a problem and thus he can send the subway to the airport directly, without the circuitous air train project that even less acerbic transit writers like Ben and Yonah hate. I disagree with this line, on two different grounds. The first is that the RPA has two other reasons to support a western extension of the Astoria Line: it connects to the waterfront (which, following de Blasio and his support for the waterfront tramway, the RPA wants to develop further), and it got a station on Triboro in the Third Regional Plan, in the 1990s. I can no longer find the map with the stations on Mike Frumin’s blog, but the plan was to have a station every 800 meters, with a station to the west of Ditmar/31st still in Queens, around 21st Street; only in the more recent plan did the RPA redesign the idea as Crossboro, with much wider stop spacing. The second grounds for disagreement is that the RPA presented a long-term vision. If Cuomo’s flawed LGA connector is there, then it will embolden him to find money to build this connection, even though it’s slower than taking a bus to the subway today. It will not embolden anyone to look for funding for the extension of the Astoria Line to the west, since there is no force clamoring for such extension – not the neighborhood, and not even the RPA, which includes this line on a long list of proposals. As I said on Curbed, the RPA has been around for 90 years. Cuomo is just a governor, not even the leader of a real political movement (unlike Bernie Sanders, who seems to be interested in his leftist agenda more than in himself). There is no reason for an organization so venerable to tether itself to a politician who isn’t likely to be around for more than a few more years. On the contrary, it can provide cover for Cuomo to change his plan, if it does some legwork to prove that people in Astoria actually are interested in subway expansion to the east. The RPA has just put up its Fourth Regional Plan, recommending many new subway and commuter rail lines in New York, ranging from good (125th Street subway, Brooklyn-Lower Manhattan regional rail) to terrible (Astoria Line extension to the west rather than to LaGuardia, which gets a people mover heading away from Manhattan). I have a poll for Patreon supporters for which aspects I should blog about; I expect to also pitch some other aspects – almost certainly not what I said in my poll – to media outlets. If you support me now you can participate in the poll (and if you give $5 or more you can see some good writings that ended up not getting published). If you want to be sneaky you can wait a day and then you’ll only be charged in January. But you shouldn’t be sneaky and you should pledge today and get charged tomorrow, in December. It’s hard to really analyze the plan in one piece. It’s a long plan with many components, and the problems with it don’t really tell a coherent story. One coherent story is that the RPA seems to love incorporating existing political priorities into its plan, even if those priorities are bad: thus, it has the AirTrain LaGuardia, favored by Cuomo, and the Brooklyn-Queens Connector (BQX), favored by de Blasio, and even has tie-ins to these plans that don’t make sense otherwise. Some of the regional rail money wasters, such as Penn Station South and the new East River tunnels from Penn Station to the LIRR, come from this story (the LIRR is opposed to any Metro-North trains going to Penn Station under the belief that all slots from points east to Penn Station belong to Long Island by right). However, there remain so many big question marks in the plan that are not about this particular story that it’s hard to make one criticism. I could probably write 20,000 words about my reaction to the plan, which is about 15 published articles, and there are, charitably, 5 editors who will buy it, and I’m unlikely to write 10 posts. I was mildly embarrassed by how much crayon I was proposing, which is why what I put in my NYU presentation 3 weeks ago was the 5-line system, where Line 1 (red) is the Northeast Corridor and the Port Washington Branch, Line 2 (green) is much the same but through the new Hudson tunnels, Line 3 (orange) is the Empire Connection and the Hempstead Branch, Line 4 (blue) connects the Harlem Line and Staten Island, Line 5 (dark yellow) connects the Erie Lines with the Atlantic Branch and Babylon Branch, and Line 6 (purple) is just East Side Access. 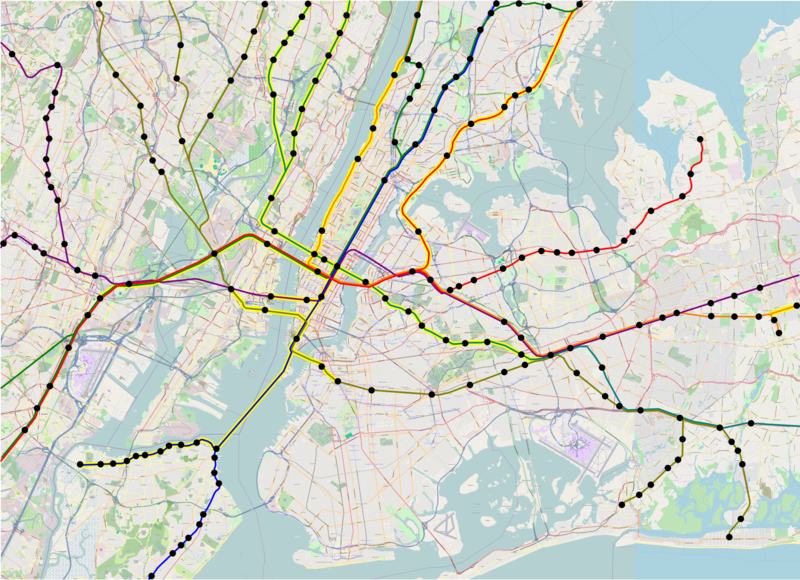 In the 7-line system, Line 6 gets extended to Hoboken and takes over the Morris and Essex Lines, and Line 7 (turquoise) connects the Montauk Line with the Northern Branch and West Shore Line via 43rd Street, to prune some of the Line 5 branches. Counting the Triboro-Staten Island tunnel and Gateway starting from the portal (not at Secaucus as the map portrays), this is 58 route-km, and about 62 double-track-km of tunnel (the Third Avenue trunk line needs four tracks between 57th and Houston at a minimum), for substantially the same capacity. The difference is that the RPA thinks Metro-North needs two more tracks’ worth of capacity between Grand Central and 125th, plus another two-track tunnel in the Bronx; from Grand Central to Woodlawn, the Fourth Regional Plan has 19 km, slightly more than 100% of the difference between its tunnel length and mine. My plan has more underwater tunnel, courtesy of the tunnel to Staten Island, but conversely less complex junctions in Manhattan, and much more austere stations (i.e. no Penn Station South). As I said, I don’t want to go into too much detail about what the RPA is doing, because that’s going to be a series of blog posts, most likely a series of Streetsblog posts, and possibly some pieces elsewhere. But I do want to draw a contrast between what the RPA wants for regional rail and what I want, because there are a lot of similarities (e.g. look at the infill on the Port Washington Branch in both plans), but some subtle differences. What I look for when I think of regional rail map is an express subway. I’ve been involved in a volunteer effort to produce a regional rail plan for Boston, with TransitMatters, in which we start by saying that our plan could be a second subway for Boston. In New York, what’s needed is the same, just scaled up for the city’s greater size and complexity. This means that it’s critical to ensure that the decision of which lines go where is, for lack of a better word, coherent. There should be a north-south line, such as the Third Avenue trunk in the Fourth Regional Plan or my Line 4; there should be an east-west line, such as the lines inherited from the legacy Northeast Corridor and LIRR; and so on. The one big incoherence in my plan is the lack of a transfer station between Line 4/6 and Line 1/3 at Madison and 33rd. This is on purpose. Line 2 connects Penn Station and Grand Central, Madison/33rd is well to the south of Midtown’s peak job density, and Lines 4 and 6 shouldn’t be making more stops than the 4 and 5 subway lines, which go nonstop between Grand Central and Union Square. The other weirdness is that in the 7-line system, unlike the 5-line system, there is no way to get between the Northern Branch or the West Shore Line and the rest of New Jersey without going through Manhattan. In the first map of this system that I made on my computer, Line 7 has an awkward dip to serve the same Bergenline Avenue station as Line 2. But I think what I posted here, with two separate stations, is correct: Lines 6 and 7 are lower priorities than a subway under Bergenline Avenue, which would make intra-state connections much easier. It’s difficult to depict rail extensions at different scales on one geographically accurate map, and doing a schematic map like the London Underground isn’t useful for depicting new lines, which should make it clear to readers where they go. But the 7-line system must be accompanied by subway extensions, some covered by the RPA (Utica, Nostrand) and some not (Bergenline, again). I recently had to give a short description of my program for good transit, and explained it as, all aspects of planning should be integrated: operations and capital planning, buses and light rail and subways and regional rail, infrastructure and rolling stock and scheduling, transit provision and development. When I make proposals for regional rail, they may look out there, but the assumption is always that there’s a single list of priorities; the reason I depict a 7-line map, or even a 9-line map (in progress! ), is to be able to plan lines 1-3 optimally. Everything should work together, and if agencies refuse to do so, the best investment is to make sure those agencies make peace and cooperate. The RPA plan sometimes does that (it does propose some regional rail integration), but sometimes it’s a smörgåsbord of different politically-supported proposals, not all of which work together well. At Bourg-la-Reine, the buildings just east of the station are high-rise. There are local community amenities, including walkable schools, supermarkets, and pharmacies, and people can comfortably live in this suburb without a car. This generates significant RER traffic at all hours of day: outbound trains are often standing-room only until they reach this station even in midday, outside rush hour. At Southport, there are a few townhouses near the station. But the roads are wide and hostile to pedestrians, and the nearest supermarket closes at 6 pm, too late for commuters returning from the city. Car ownership approaches 100%, and nobody rides the trains except to get to office jobs at the traditional peak hour in Manhattan (or perhaps Stamford). The difference between the two places is so stark that they can barely be compared. Southport has 317 inbound boardings per weekday. Of those, 263, or 83%, are in the morning rush hour; the Metro-North-wide average is 63%, and the average on the SNCF-operated parts of the RER and Transilien is about 46%. Bourg-la-Reine has 4.5 million annual riders, about 16,000 on an ordinary working day. A huge part of the difference is about service provision – Bourg-la-Reine has a train every five minutes midday, Southport a train every hour. But it’s not just about service. The RER has stations farther out, with somewhat less intense service, such as a train every 15 minutes, with comparable ridership. And the LIRR and Metro-North have little off-peak ridership even at stations with more frequent service, such as Mineola and Hicksville. Transit-oriented development (TOD) is as important as good service in such cases. I bring up Southport because the RPA just dropped a study about suburban TOD that grades every New York commuter rail station between 0 and 3, and gives Southport the highest mark, 3. The RPA study looks at zoning within 800 meters of each station and considers whether there’s a parcel of land that permits multifamily housing with a floor are ratio higher than 1.25. Southport has such lots, supporting some townhouses, so according to the RPA it gets full marks, even though, by RER standards, it is like every other American car-oriented suburb. Based on this methodology, the RPA identifies a number of good suburbs, and even comes to policy conclusions. It proposes more TOD in the mold of existing exurban New York examples, such as Patchogue. The model for the program is the real reason the RPA study is so weak: rather than calling into attention the big differences between land use at suburban stations in New York versus in Paris (or any number of big European cities with suburban rapid transit), it overfocuses on small differences within auto-oriented suburbia. Some of the ultimate conclusions are not terrible. For example, the RPA is proposing linking federal infrastructure development to permitting more multifamily housing. This would improve things. However, the problem with this is twofold. First, it is unrealistic – the federal government gave up decades ago on enforcing fair housing laws, and has no interest in attempting to make exclusionary suburbs behave. Were I to propose this, hordes of American commenters would yell at me for not understanding American politics. And second, it misunderstands the nature of the problem, and ends up proposing something that, while unrealistic, is still low-impact. The best way to understand the problem with the study is what author Moses Gates told me on Twitter when I started attacking it. He said that the RPA was looking at zoning rather than actual development. Since there is zoning permitting multifamily development within the prescribed radius at Southport, it gets full marks. With my understanding of what good TOD looks like, I would be able to say that this is clearly so bad the methodology must be changed; on Twitter I suggested looking at zoning within 300 meters of the station rather than 800, since the highest-intensity development should be right next to the station. I also suggested looking at supportive nonresidential uses, especially supermarkets. A development that isn’t walkable to retail at reasonable hours is not TOD. The RPA does not think in this language. It thinks in terms of internal differences within the US. Occasionally it deigns to learn from London, but London’s suburban development is auto-oriented by European standards (transit mode share in the London commuter belt is at best in the teens, often in the single digits). Learning from anywhere else in the world, especially places that don’t speak English, is too difficult. This means that the RPA could not reach the correct conclusion, namely, that there is no such thing as an American suburb with TOD. The only exception I can come up with in the United States involves Arlington, on the Washington Metro, and Arlington is no longer considered a suburb, but really a full-fledged city in a different state, like Jersey City. The other thing the RPA missed is that it drew too large a radius. TOD at a train station should include townhouses 800 meters out – but it’s more important to include high-rise residential construction next to the train station and mid-rise apartment buildings 500 meters out. 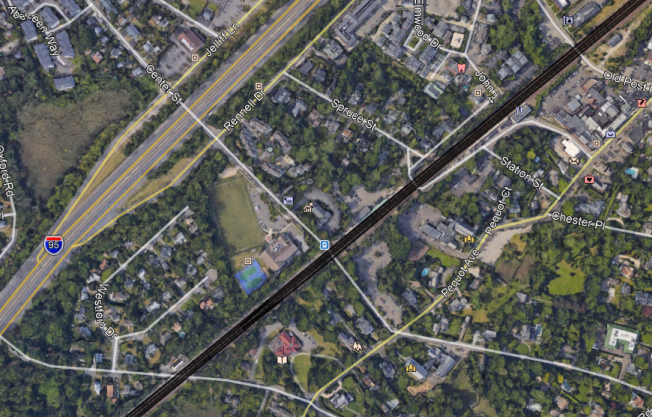 Giving American suburbs latitude to place TOD so far from the station means they will act like Southport and allow small amounts of multifamily housing out of the way, while surrounding the station itself with parking, a tennis court, and large single-family houses with private swimming pools. This is not hypothetical: suburbs in New Jersey have reacted to court rulings mandating affordable housing by permitting apartments at the edge of town, far from supporting retail and jobs, and keeping the town core single-family. States should centralize land use decisionmaking rather than give every small suburb full autonomy. TOD doesn’t need to be fully mixed-use, but there should be some local retail right next to housing. Housing should be high-density right next to the station. A floor area ratio of 1.25 is not enough. Publicly-funded social housing should be next to train stations, in the city as well as in the suburbs, and this is especially important in expensive suburbs, which aren’t building enough affordable housing. Without suburban TOD, any regional rail system is incomplete. I wish I could have covered it at my talk, but I didn’t have time. Good service needs to run to dense suburbs, or at least suburbs with dense development within walking distance of the station. It needs to extend the transit city deep into suburbia, rather than using peak-only commuter rail to extend the auto-oriented suburbs into the city. A stenographer at Bloomberg is reporting an Amtrak study that says the social benefit-cost ratio of the Gateway program is about 4. Gateway, the project to quadruple the double-track line from New York to Newark, including most important the tunnel across the Hudson, is now estimated to cost $25 billion. Cost overruns have been constant and severe: it was $3 billion in the ARC era in 2003, $9 billion when Governor Chris Christie canceled it in 2010, and $13.5 billion when Amtrak took over in 2011 and renamed it Gateway. And now Amtrak is claiming that the net present value of Gateway approaches $100 billion; in a presentation from late 2016, it claims that at a 3% discount rate the benefit-cost ratio is 3.87, and compares it positively with Crossrail and California HSR. This is incorrect, and almost certainly deliberate fraud. Let me explain why. First, the comparison with Crossrail should give everyone pause. Crossrail costs around the same as the current projection for Gateway: about $21 billion in purchasing power parity terms, but future inflation means that the $25 billion for Gateway is very close to $21 billion for Crossrail, built between 2009 and 2018. Per Amtrak, the benefit-cost ratio of Crossrail as 3.64 at the upper end – in other words, the benefits of Crossrail and Gateway should be similar. They are clearly not. The projection for Crossrail is that it will fill as soon as it opens, with 200 million annual passengers. There is no chance Gateway as currently planned can reach that ridership level. New Jersey Transit has about 90 million annual rail riders, and NJT considers itself at capacity. This number could be raised significantly if NJT were run in such a way as to encourage off-peak ridership (see my writeup on Metro-North and the LIRR, for which I have time-of-day data), but Gateway includes none of the required operational modernization. Even doubling NJT’s ridership out of Gateway is unlikely, since a lot of ridership is Hoboken-bound today because of capacity limits on the way to New York, and Gateway would cannibalize it; only about 60 million NJT riders are taking a train to or from New York, so a more realistic projection is 60 million and not 90 million. Some additional ridership coming out of Amtrak is likely, but is unlikely to be high given Amtrak’s short trains, hauled by a locomotive so that only 5-7 cars have seats. Amtrak has an asterisk in its comparison saying the benefit-cost ratios for Crossrail and Gateway were computed by different methodologies, and apparently the methodologies differ by a factor of 3 on the value of a single rider. That, by itself, does not suggest fraud. What does suggest fraud is the history of cost overruns. The benefits of Gateway have not materially increased in the last decade and a half. If Gateway is worth $100 billion today, it was worth $100 billion in 2011, and in 2003. One change since 2011 is Hurricane Sandy, which filled the existing North River Tunnels with corrosive saltwater. A study on repairs recommended long-term closure, one tube at a time. But the difference is still small compared to how much Amtrak thinks Gateway is worth. The study does not claim long-term closure is necessary. Right now, crews repair the tunnels over weekends, with weekend closures, since weekend frequency is so poor it can fit on single track. The study does not say how much money could be saved with long-term closures, but the cost it cites for repairs with long-term closures is $350 million, and the cost under the current regime of weekend closures cannot be several billion dollars more expensive. The extra benefit of Gateway coming from Sandy is perhaps $1 billion, a far cry from the almost $100 billion projected by Amtrak for Gateway’s worth. What this means is that, if Gateway really has a benefit-cost ratio approaching 4 today, then it had a benefit-cost ratio of about 7 in 2011. Amtrak did not cite any such figure at the time. In 2003 it would have have had a benefit-cost ratio approaching 25, even taking into account inflation artifacts. None of the studies claimed such a high figure. Nor did any of the elected or appointed officials in charge of the project act like it was so valuable. Construction was not rushed as it would have if the benefit-cost ratio was so high that a few years’ acceleration would have noticeable long-term consequences. The scope of the project did not suggest an extreme benefit-cost ratio, either. ARC, then Gateway, was always just two tracks. If a two-track tunnel has a benefit-cost ratio higher than 20, then it’s very likely the next two-track tunnel has a high benefit-cost ratio as well. Even a benefit-cost ratio of 4 would lead to further plans: evidently, Transport for London is planning Crossrail 2, a northeast-southwest tunnel complementing the east-west Crossrail and north-south Thameslink. Perhaps in 2003 Port Authority thought it could not get money for two tunnels, but it still could have planned some as future phases, just as Second Avenue Subway was planned as a full line even when there was only enough money for Phase 1. The plans for ARC included the awkward Secaucus loop bringing in trains from the Erie lines into Penn Station, with dual-mode diesel/electric locomotives. This is a kludge that makes sense for a marginal project that needs to save every penny, not for one where benefits exceed costs by more than an order of magnitude. For such a strong project, it’s better to spend more money to get it right, for example by electrifying everything. It would also have been better to avoid the loop kludge and send Erie trains to Lower Manhattan and Brooklyn, as I have proposed in various iterations of my regional rail plan. All of this together suggests that in 2003, nobody in charge of ARC thought it was worth $70 billion in 2003 dollars, or around $100 billion in 2017 dollars. Even in 2011, Amtrak did not think the project was worth $85 billion in 2011 dollars. It’s theoretically possible that some new analysis proves that old estimates of the project’s benefits were too low, but it’s unlikely. If such revisions were common, we would see upward and downward revisions independent of cost overruns. Some rail projects with stable costs would see their benefit-cost ratios shoot up to well more than 10. Others might be revised down below 1. What we actually see is different. Megaprojects have official estimates on their benefit-cost ratios in a narrow band: never less than 1 or else they wouldn’t be built, never more than 4 or 5 or else people might disbelieve the numbers. In an environment of stable costs, this would make a lot of sense: all the 10+ projects have been built a long time ago, so the rail extensions on the table today are more marginal. But in an environment of rapid cost escalation, the fact that benefits seem to grow with the costs is not consistent with any honest explanation. The best explanation for this is that, desperate for money for its scheme to build Gateway, Amtrak is defrauding the public about the project’s benefits. Earlier this month, Andrew Cuomo unveiled a proposal to spend $10 billion on improvements to JFK Airport, including new terminals, highway expansion, and public transit access. I encourage readers to look at the plan: the section on highways proposes $1.5-2 billion in investment including adding lanes to the Van Wyck Expressway and to on-ramps, and has the cheek to say that this will reduce fuel consumption and greenhouse gas emissions. This while the section on mass transit gives it short shrift, only proposing superficial improvements to the AirTrain; in the unlikely the case that this is built, highway mode share will grow and transit mode share will fall. Put in plainer terms, the environmental case for the plan includes fraud. However, this is not really the topic of this post. That Andrew Cuomo lies to the voters and doesn’t care about good transportation is by now a dog-bites-man story. Instead, I want to focus a little on a throwaway line in the plan, and more on the Regional Plan Association’s reaction. The throwaway line is that almost every major world airport has a one-seat train ride to city center, and by implication, so should JFK. A good study for public transit should not only consider different alignments and service patterns, but also question whether the project is necessary. The US requires environmental impact statements to include a no build option; European countries require a cost-benefit analysis, and will not fund projects with a benefit/cost ratio under 1.2, because of cost escalation risk. The RPA study does not question whether a one-seat ride from JFK to Manhattan is necessary or useful. It assumes that it is. Everything else about the study follows from that parameter. Thus, it considers entirely express plans, such as the LIRR option, alongside local options. Everything is subsumed into the question of connecting JFK to Manhattan. 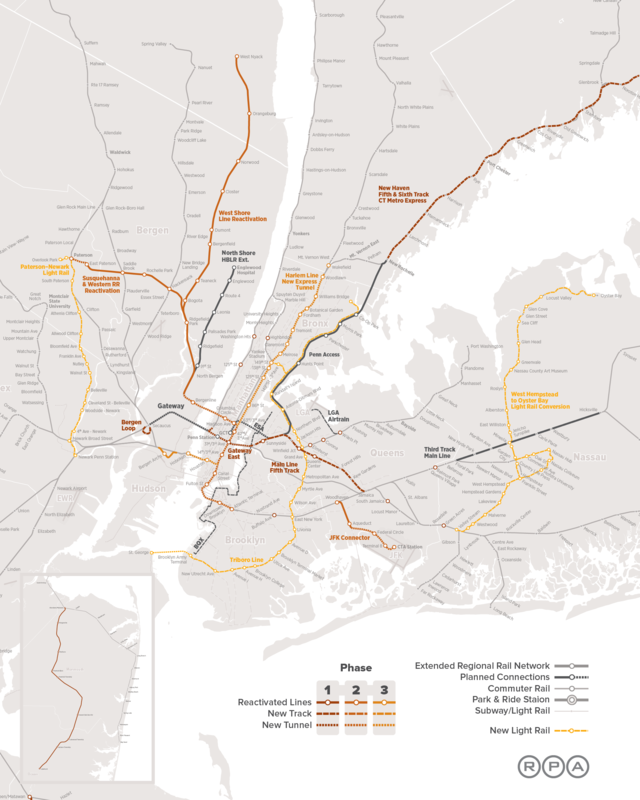 One of the alignments proposed is via the LIRR Atlantic Branch and Second Avenue Subway, which the RPA has long believed should be connected. The brief says that it would be slow because it would have to make many local stops; I’ll add that it would serve Midtown, where nearly all the hotels are, via a circuitous alignment. But with all these stops on the way, shouldn’t this be considered as primarily a new trunk line connecting Eastern Brooklyn with Second Avenue? The question of whether the eastern terminus should be Jamaica or JFK must be subsumed to a study of this specific line, which at any rate is unlikely to offer faster service to JFK than the existing AirTrain-to-E option. After all, the most optimistic ridership projection for a JFK connector is maybe 40,000 users per day, whereas the projection for the full Second Avenue Subway is 500,000. I don’t think a Second Avenue-Atlantic Branch connection is warranted, but if it is, the question of whether to serve JFK at the end is secondary. I lived in Stockholm for two years, where I went to the airport exclusively using the Arlanda Express, a premium express link running nonstop between the airport and city center. I imagine many visitors to Stockholm use it, are satisfied, and want to replicate it in their own cities. Unfortunately, such replications miss something important: any air-rail link must go to the areas that people are likely to want to connect to. For locals who wish to travel to the airport, this means good connections to the local transit network, since they are likely to come from many neighborhoods. Not even a small city like Stockholm worries about providing rich areas like Vasastan and Roslag with a one-seat ride. For visitors, this means a one-seat ride to where the hotels are. Stockholm is a largely monocentric city, with one city center where everything is. (It has an edge city in Kista, with more skyscrapers than Central Stockholm, but Kista can’t be reasonably connected to the airport). The situation in other cities is more complicated. And yet, express air links prioritize serving a big train station even if it’s poorly connected to the transit network and far from the hotels. Let us consider London and Paris. In London, the five-star hotels cluster around the West End. Only two are at Paddington Station, and only a few more are an easy walking distance from it. This is where the Heathrow Express and the slower Heathrow mainline trains go. No wonder the Heathrow Express’s mode share, as of 2004, is 9%, whereas other Heathrow connections, mainly the Piccadilly line, total 27% (source, PDF-p. 28). The Piccadilly line beautifully passes through the parts of the West End with the largest concentration of hotels, and last time I was in London, I chose it as my Heathrow connection. Nonetheless, the government chose to build the Heathrow Express. In Paris, the five-star hotels cluster in the west of the city as well, in the 8th arrondissement. The current airport connection is via the RER B, which offers express service in the off-peak when there’s capacity, but not in the peak, when there isn’t. Even so, it is a local commuter rail service, with good connections to the city transit system, and a two-seat ride to the 8th. Because of slow perceived speeds, the state is planning to build an express connector, originally planned to open in 2015 but since delayed to 2023. 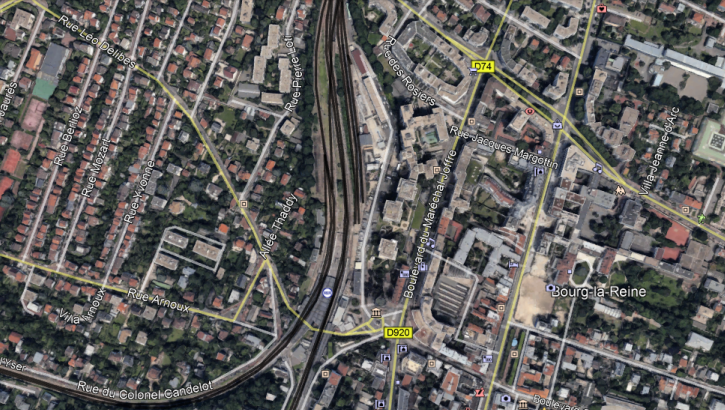 The express connector will dump passengers at Gare de l’Est, with no hotels within walking distance, no access to Metro lines serving the hotel clusters (Metro 7 does so peripherally, M4 and M5 not at all), and a long walk to the RER for passengers wishing to connect to longer-range destinations such as parts of the Left Bank. I bring this up to show that the idea of the express air-rail link is a fetish rather than a transportation project, and by analogy, so is the one-seat ride. There is value in faster service and in minimizing the number of transfers, but express airport connectors attempt both even at the cost of building a line that doesn’t go where people want to go. Cuomo has many concerns. The chief one is most likely winning the 2020 presidential primary. He has been running for president since the moment he was elected, and many of his policies – gay marriage, the feuds with Bill de Blasio, the desperate attempt to build shiny infrastructure with his name on it – are best viewed through that lens. To the extent that he is not running for president, he has attempted to cement absolute power within the state. He backed a palace coup in the State Senate that secured a Republican(-ish) majority even though the Democrats won most seats; a Democratic majority would be led by a different faction of the party, one more beholden to Democratic interest groups, and might send Cuomo bills that he would lose political capital if he either signed or vetoed them. This is why I keep giving him as an example of an autocrat in various posts; here is the major takedown, but see also here. Autocrats are always bad for the areas that they govern, which as two separate implications. The first is that their choice of spending priorities is compromised by the need to expand their own power and glory: even if you believe that New York needs $1.5-2 billion in new highway spending, is the Van Wyck really the best place for it? The second and worse implication is that it is hard for outside groups to convince autocrats to do better. Autocrats don’t have to listen; if they did, they would be democratic leaders. Cuomo happens to be an anti-transit autocrat, and this means that pro-transit groups in New York need to view him as an obstacle and work to weaken him, rather than to ask him to please consider their plans for an air-rail link. The difficulty is that, precisely because local- and state-level democracy in the US is so weak, it is difficult for issue-oriented groups to go out and oppose the governor. Planners in Democratic cities are hesitant to attack budget-cutting Republican governors like Charlie Baker and Larry Hogan; attacking Democratic governors like Cuomo is a nonstarter. Nonetheless, the RPA needs to understand that it needs to oppose governments hostile to public transit rather than ask them to improve. When Cuomo proposes a bad transportation project, say “no” and move on to more important things; don’t try to work with him, because nothing good can come of that. As the Regional Plan Association continues to work on its Fourth Regional Plan, expected to be published next year, it’s releasing various components of the upcoming agenda. One, an update from the Third Regional Plan from 1996, is a line variously called Triboro or Crossboro. In the third plan, Triboro RX was meant to be a circumferential subway line, taking over existing abandoned and low-traffic freight rail rights-of-way in Brooklyn, Queens, and the South Bronx, terminating at Yankee Stadium via a short tunnel. It was never seriously proposed by any political actor, but was briefly mentioned positively by then-MTA chair Lee Sander in 2008, and negatively mentioned by Christine Quinn, who called for a bus line along a parallel alignment in her mayoral campaign in 2013. In 2014, Penn Design proposed a variant it calls Crossboro, which differs from the original Triboro proposal in two ways: first, the stop spacing is much wider, and second, instead of the short tunnel to Yankee Stadium, it continues northeast along the Northeast Corridor, making four stops in the Bronx as in the proposed Metro-North Penn Station Access plan. Crossboro is an inferior proposal, and unfortunately, the fourth plan’s Triboro proposal downgrades it from the original alignment to Crossboro. As I explained a year and a half ago, specifically in the context of Crossboro, it is poor planning to run train service that begins as a radial and then becomes as a circumferential instead of continuing into the center. The route of Crossboro, and now also the Triboro plan, involves going from the North Bronx to the south in the direction of Manhattan, but then turning southeast toward Queens and Brooklyn, rather than continuing to Manhattan. Briefly, in a system with radial and circumferential routes (as opposed to a grid), circumferential service is the most effective when it connects to secondary centers, and has easy transfers to every radial. If a line runs as a radial and then switches to circumferential, its ability to connect to other radials is compromised, making it a weaker circumferential; nor could it ever be even a half-decent radial without service to the CBD. Lines with such service pattern, such as Line 3 in Shanghai and the G train in New York until 2001, tend to underperform. However, the stop spacing deserves to be treated separately. Under both Crossboro and the RPA’s new version of Triboro, there are too few stops for the line to be useful as an urban rail service. I’m going to ignore the connection between Queens and the Bronx, which as a major water crossing can be expected to have a long nonstop segment, and talk first about the Bronx, and then about Queens and Brooklyn. In the Bronx, there are four stops in 10 km, starting counting from where the bridge toward Queens begins to rise. This may be reasonable for a commuter rail service with local service extending well past city limits (to New Rochelle or even Stamford), but when it terminates within the city, it’s too far for people to be able to walk to it. The proposed stops also miss the Bronx’s most important bus route, the Bx12 on Fordham Road, which in 2015 became the city’s busiest single bus route. A stop on the Pelham Parkway, the continuation of Fordham in the East Bronx, would be a massive travel time improvement over trying to reroute the Bx12 to meet a train station near Coop City, the proposed northern terminus of both Crossboro and the new Triboro. Conversely, it would delay few other passengers, by very little, since there would only be one further stop north. The result of the proposed stopping pattern is then that most people living near the line would not be able to either walk to it or take a frequent bus. In Queens and Brooklyn, starting from Astoria and going south, the route is 26 km long, and the new Triboro makes 17 stops. The average interstation, 1.5 km, is noticeably above the international subway average, and is especially high for New York, whose stop spacing is near the low end globally. The original version had 29 stops over the same distance, and one more stop between Astoria and the bridge. Unlike in the Bronx, in Brooklyn all streets hosting major radial routes get subway stops. However, long stretches of the route get no stops. The stop spacing is not uniform – from Northern Boulevard to Grand Avenue there’s a stretch with 4 stops in 2.8 km (counting both ends), but from Astoria-Ditmars to Northern Boulevard there’s a 2.5 km nonstop service, skipping Astoria Boulevard and Steinway, passing through a medium-density neighborhood south of the Grand Central Parkway with mediocre subway access. A stop at Astoria Boulevard and Steinway is obligatory, and probably also one between Astoria and Northern, around 49th Street. To the south of Grand Avenue, the proposal calls for a 2.1 km nonstop segment to the M terminus at Metropolitan Avenue, skipping Middle Village, which is cut off from Grand by the Long Island Expressway and from the M by cemeteries. An additional stop in the middle of this segment, at Eliot Avenue, is required. In Brooklyn, the route runs express next to the L train, splitting the difference between serving Broadway Junction (with a connection to the A/C) and Atlantic Avenue (with a connection to the LIRR): the RPA’s diagram depicts a station at Atlantic Avenue but calls it Broadway Junction. Farther south, it makes a few stops on an arc going southwest toward southern Brooklyn; the stops are all defensible, and the stop spacing could potentially work, but there are still potential missing locations, and some nonstop segments in the 1.7 km area. For example, it goes nonstop between Utica and Nostrand Avenues, a distance of 1.7 km, with a good location for an interpolating station right in the middle, at Albany Avenue. From Nostrand west, it stops at a transfer to every subway line, except the R. In that segment, one more stop could be added, between the F and the D/N; the reason is that the gap between these two lines is 1.8 km, and moreover the right-of-way slices diagonally through the street grid, so that travel time from the middle to either stop is longer along the street network. However, overall, this is not why I dislike the route. Finally, at the western end, the route is especially egregious. The right-of-way is parallel to the N train, but then awkwardly misses 59th Street, where the N veers north and starts going toward Manhattan. The original proposal had a stop several blocks away from 59th, with a long transfer to the R (and N); this one drops it, so there is no R transfer in Brooklyn – trains express from the D/N transfer at New Utrecht to the terminus at Brooklyn Army Terminal, where there is very little development. There are practically no through-riders who would be inconvenienced by adding the extra two N stops in between. In contrast, due to the low frequency of the N (it comes every 10 minutes off-peak), making passengers originating in those stations who wish to ride Triboro transfer would add considerably to their travel time. A route like Triboro has an inherent problem in deciding what stop spacing to use, because as a circumferential, it is intended to be used on a large variety of origin-destination pairs. For passengers who intend to connect between two outer radial legs more quickly than they could if they transferred in Manhattan, the wider stop spacing, emphasizing subway connections, is better. However, the mixed radial-circumferential nature of the new Triboro makes this a losing proposition: there’s no connection to any subway line in the Bronx except the 6. Moreover, in Brooklyn, there’s no connection in Brooklyn to the R, and if there’s a connection to the A/C, it involves walking several hundred meters from what on the L is a separate subway stop. In contrast, for passengers whose origins are along the line, narrower stop spacing works better, because they’re unlikely to cluster around the connection points with the radial subway lines. (The line has no compelling destinations, except maybe Jackson Heights and Brooklyn College; in the Bronx, the two most important destinations, the Hub and Yankee Stadium, are respectively close to and on the old Triboro route, but far from the new one.) The aforementioned Astoria/Steinway, Eliot, and Albany, as well as the skipped stations along the L and N routes, all have reasonable numbers of people within walking distance, who have either poor subway access (the first three) or only radial access (the L and N stations). What’s more, if trains make more stops, the increase in travel time for passengers connecting between two legs is not large compared with the reduced station access time for passengers originating at an intermediate station. The reason is that passengers who connect between two legs are not traveling all the way. The fastest way to get from the West Bronx to southern Brooklyn is to take the D train all the way, or take the 4 to the D; from the 6 train’s shed, the fastest way is to take the 6 and transfer to the N/Q at Canal or the B/D at Broadway/Lafayette. No circumferential service can change that. The benefit of circumferential service is for people who travel short segments: between the Bronx and Queens, or between the 7 or the Queens Boulevard trains and the lines in Brooklyn that aren’t the F. Given high circumferential bus ridership in Brooklyn – two circumferential routes, the B6 and B35, rank 2nd and 4th borough-wide and 4th and 7th citywide, despite averaging maybe 9 km/h – connections between two Brooklyn legs are also likely. For those passengers, making a few more local stops would add very little to travel time. The subway has a total stop penalty of about 45 seconds per station. Of the ten extra stops I list as required – Astoria/Steinway, Eliot, Albany, 59th, four along the L, and two along the N – three (the two on the N and 59th) are basically end stations, and few passengers have any reason to travel over more than five of the rest. In contrast, adding these ten stops would improve the quality of transfers to the R and A/C and provide crucial service to intermediate neighborhoods, especially Middle Village. Finally, let me make a remark about comparative costs. The original Triboro plan required a short tunnel, between Melrose Metro-North station and Yankee Stadium; the new one does not. However, a single kilometer of new tunnel in the context of a 34 km line is not a major cost driver. The new proposal is actually likely to be more expensive. It is longer because of the segment in the Bronx along the Northeast Corridor, about 40 km in total, and 10 km would be alongside an active rail line. There are plans for increased mainline passenger rail service on the line: Penn Station Access, plus any improvements that may be made to intercity rail. Far from offering opportunities to share costs, such traffic means that any such plan would require four tracks on the entire line and flying junctions to separate trains going to Penn Station from trains going to Brooklyn. Fare collection would be awkward, too – most passengers would transfer to the subway, so subway faregates would be required, but commuter rail has no need for faregates, so sharing stations with Penn Station Access would require some kludge that wouldn’t work well for any mode. Tunneling is expensive in New York, but so is at-grade construction; a kilometer of tunnel in the Bronx is unlikely to cost more than configuring an active rail mainline for a combination of suburban and high-frequency urban service. The RPA proposes the London Overground as a model, treating the new Triboro as a commuter line offering subway service levels. Everywhere else I’d support this idea. But here, it fails. First, as I explained in a previous post, the routing is an awkward mix of radial and circumferential. But second, the stop spacing only works in the context of a long suburban line feeding city center, and not an urban circumferential line. In the context of an urban line, more stops are needed, to let people walk from more neighborhoods to the train, or take a connecting bus. For the most part, the original Triboro plan, designed around interstations of about 900 meters not counting the water crossing, would work well. Crossboro, and its near-clone the new Triboro, is inferior to it in every respect, and the RPA should jettison it from the Fourth Regional Plan in favor of the old proposal.